Am I Just a Slow Painter? Subject: Am I Just a Slow Painter? I don't really know anyone else that does much miniature painting to compare next to. I don't know if I'm working slower than average or just aiming for more detail than most people aim for their tabletop grunts/ horde units. The pictured model I finished about 4 hours with basing taking longer due to waiting to the next day for the glue to properly dry. Once that's dry it takes about an hour just due to needing to wait for a wash to dry through all the gravel. If I'm doing marines I try to do 2-3 at once, but the cultist I'm finding have so much color variation per model it makes it awkward to paint many at once. It's led me to have a bit of a problem where I enjoy painting up heroes and characters, but when it comes to grunts I struggle to stay motivated if I let my head focus on more than one squad at a time. Granted, this is partly due to me putting models not in use in a display case to keep them safe from dogs, so whenever I walk by I notice every error on them. If it's a case of, "Wow, I bang out a model that looks like that in an hour." I'll have to really look into what I can do to speed things up. If it's a case of, "Yeah, that's about how long it takes me to make something along those lines." I'll at least know I'm not just dragging compared to others and my technique is in a decent place I shouldn't worry about as much. Sorry if this was a bit rambly, but needed to ask someone about this. Here's an example piece to give an example of the paint level I generally try to aim for. Subject: Re:Am I Just a Slow Painter? 1) Grab 10 marines and ONLY 1 character to paint. 2) Give all models equal time,don't focus on the character. 3) Get used to doing 1 part on each model at a time(armour,weapon,accessory etc) don't focus on the character! 4) You'll find that you'll find your focus expands and it will become more easier to paint less 'exciting' figures! 5) Learn to enjoy painting less 'exciting' figures,trust me, they'll surprise you! Heh. I did 160 Cultists and know exactly what you are talking about. If it helps, I try to work out a process with each set of models. That starts with blocking out the base colors, adding shade with washes, highlighting the raised areas, then doing the details. For Cultists, I wanted variation, but not too much variation. I took them in squads of 10 and painted each one with the same colors. When I field them, I just try to make sure the color variations are not standing too close together. Looks very Chaotic. That's a nice looking miniature btw. Might be more than I could do in 4 hours. I have 14 Skaven Clanrats to paint when I have finished the test model to check out the highlights, rusting etc. Best thing you can do is to pick 2 or 3 primary colours for the Unit (I am using Red with smaller areas of Black and Bone coloured cloth) which means I do all of the red basecoat, then add the black and bone bits, then armour, wood, weapons etc. I can then wash them all at the same time as its pretty much Agrax Earthshade all over, then highlight them. I cant comment on time taken per se, but I cant imagine it will be too much longer than 3 nights of painting, around 6-8 hours total. The colour variations make the unit look more chaotic and like they have scavenged up some clothes from the sewer without breaking the look of the fact that it is a unit, something you can probably do with your cultists. "Rock breaks scissors. But paper covers rock, and scissors cut paper! Kiff: we have a conundrum...... Search them for paper... and bring me a rock." For years, I had the same problem - putting way to much time/effort per mini. 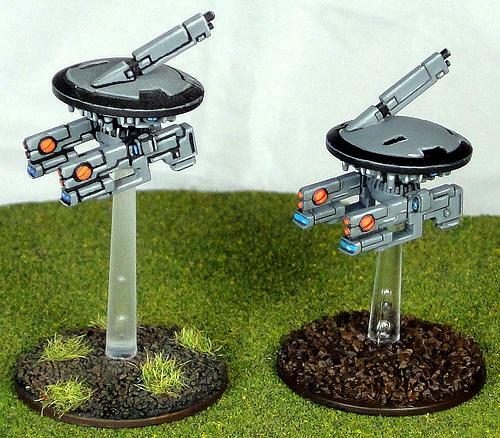 The drone on the left was primed black, then painted black (so that touch ups of the black would match), then each grey panel was painted individually, followed by highlights. The drone on the right was primed black, airbrushed grey, then the crevices were washed with Nuln Oil. Then highlighted the same way as the first model. Now, the first drone looks better (IMO), as hit has stronger contrast that will stand out at a distance. But it takes twice as long to paint. I'd rather spend 1.5 hours per drone than 3 hours per drone. The new(ish) Plague Marines are chock full of detail. I chose colors on the basis that each color should go well with 2 successive washes (Agrax Earthshade and Druchii Violet, in that order). I blocked out the colors, did both washes, and a bit of highlighting. Because I chose my colors carefully and worked out a procedure before hand, these took very little time to paint (maybe 2 hours per), but all the detail is visible. Now, this sort of planning can be limiting. I wouldn't go with both red and yellow on the same model because it would be hard to find a wash that works with both colors plus flesh and blue, The more colors you add, the more complex and time consuming it's going to get, but having a solid, organized painting plan really speeds things up! Reikland flesh works well for red, yellow, light browns, gold, copper, Caucasian skin tones (I usually add a bit of the flesh paint to the wash to reduce the harshness). It can also be used to shade mid-green if you want to get a Forest camouflage vibe. I personally dislike working with blue, as washing doesn't seem to work well to shade it. Thanks for the advice everyone. I appreciate you taking the time out. @Techsoldatan. I've got to salute you man. I don't know if I could make it through 160 without burning out hard. I'm already looking at 30 to 40 as a bit daunting. I'd say 4 hours for that model is ok. Could knock out a handful in the same colours in the same amount of time probably but that's where I find I have to keep characters or fancier models as a reward. My biggest project recently was getting through the WHQ Hammerhall box. 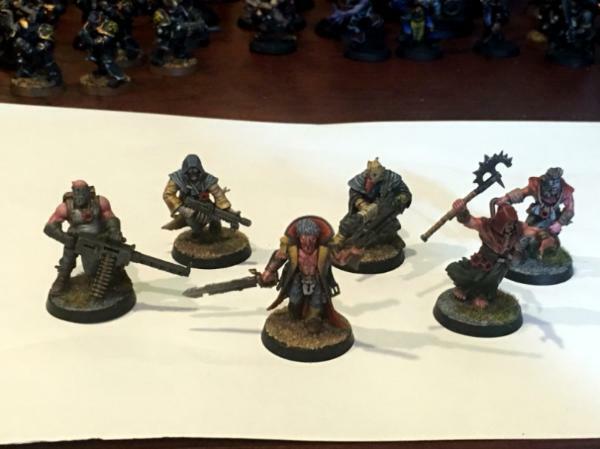 Painted the heroes first, and it really made the Acolytes and Bloodreavers feel like a chore. Thankfully the Blightkings were a joy to paint so getting them done in between batches of 5 of the other guys at a time helped break things up a bit. Just resort to the time-honored tradition of rewarding yourself for each "unit". Do five marines at a time...then a character. Do five more marines, then a vehicle. Or, if you have the stones - do all the troops up first. Then once you cross that threshold you're good for the rest of the way. But that takes practice and patience to do it. paint what you can in a batch that doesn't stress you out, I started painting 1 bret knight/week when I first started miniature painting, now i'm working on average of 30+ infantry in a batch, I'm starting to do 3 batches at the same time, some infantry/terrain/monster or characters so I don't get bored. paint a few sessions, rotate, and by the end of couple of weeks I have a small army done. The Mk II Marines in the first pic likely took me around 8-9 hours combined spread out over a few weeks, possibly longer as I was experimenting between P3's Red Ink and Vallejo's Air paints (which I am in love with as brush on paints at the moment). Second pic is Rubrics which took longer (Also P3 Red Ink for the Red); long enough that I've given up on the cloth bits until my next 2-3 models to try again. @Hatachi, you are too kind. This picture shows you what I did with my Cultists. Every 10 models, I just switched up the scheme. On the tabletop, I field them in large blobs and it's hard to sense a pattern - each one looks unique. It may have taken me about a month to get everything painted, based and sealed, but that's only working a few hours a night. There were some nights I finished 10 in 3 hours, there were some nights my OCD kicked in and I only finished a foot. If it helps, I started listening to podcasts while I did it. Having a process down, sticking to it, and letting the mind wander was the secret to efficiency. I thought you might care to see the squad I just finished off now that the whole group is done. It's actually fairly similar to your paintjob tech. I like! Yes, that's very similar to what I did with mine. Do I see blood spatters on the tunics of the Cultists in the first picture? This is a great idea. I'm going to try this with my characters. Bingo, the apron reminded me of a butcher's, so I played up the "bloody from the job" idea. Very clever. That's got to be part of the slow painter thing, you are giving character to the models. My camera is an iPhone and it absolutely refuses to take good pics of minis. I have 10 of the cc sergeants and every one of them has tiny distinctive details. But I did it as a last step. One thought: focus on the squads first, then go back to do the details. It always helps me to remain productive when I write down what I am going to do on a card and stick to it. When painting regular models I will do a pair or a group of five and paint the same items on each in turn, so by the time I am painting another colour the first one has dried already. Thanks for all the advise so far. I tried out several of the tips making my way through a helbrute and finished it in about 8 hours barring basing drying. I think I'm hitting a balance on speed vs detail. If you like how I did the cloth on the flamer guy you might try Ushabti Bone with a Sepia wash. If you want the cloth lighter/ darker you step it darker with Zandri Dust or Lighter with Screaming Skull. 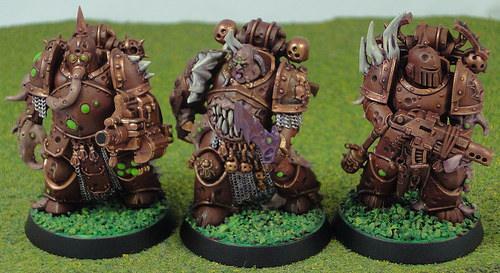 I think the slightly dirty/ worn down brown/ white would look good on those guys for the cloth. Also, I tried doing cultist 5 at a time and managed to get 5 done in about 6 hours. I'll post pics when I get home. I don't know if they came out as well as the above dudes, but I think they would pass as decently high tabletop. Thanks to everyone who provided advice. Using the tips provided I was able to pump out about 10 cultists at a roughly high level tabletop in about 8-9 hours. Here's some pics for you guys as a thank you.